Peace activist Arun Gandhi reflects on the enduring wisdom of his grandfather, the Indian spiritual and political leader Mahatma Gandhi. 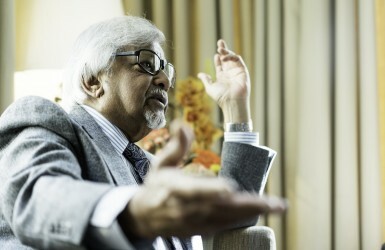 When Arun Gandhi was 12 years old, his parents sent him from their home in South Africa to live in India with his grandfather, the spiritual and political leader Mahatma Gandhi. Just 18 months later, Gandhi was assassinated, throwing the newly independent nation into turmoil. Although he initially struggled to understand his family’s response to racism and violence, his experience would eventually lead Arun – now aged 81 – to become a lifelong advocate for Gandhi’s ideals. Danielle Batist: The great legacy your grandfather left you is the notion of nonviolence. Can you explain why you see this as more than peaceful conflict resolution alone? Arun Gandhi: Unfortunately, a lot of the scholars in Gandhian philosophy all over the world have looked at nonviolence as a weapon: a strategy to use in certain conflicts. But I think it really is about personal transformation. My grandfather was very concerned about the culture of violence that dominates humankind. It has taken roots so deeply in us that we don’t even recognise that many of the things we do are violent.